Carson Foster, Jake Foster, Jacob McDonald, and Adam Chaney swam a new Junior Nationals meet record in the 400 medley relay Saturday night. The Mason Manta Rays men’s team of Carson Foster, Jake Foster, Jacob McDonald, and Adam Chaney swam a new Junior Nationals meet record and national age group record in the 400 medley relay Saturday night in the final event of the 2018 Speedo Junior National Championships. 16-year-old Carson Foster led off in 55.77, followed by 17-year-old Jake on breaststroke in 1:02.83; McDonald went 55.53 on fly, and Chaney anchored in 49.50 for a final time of 3:43.63. The Upper Dublin Aquatics team of Alessandro Borratto,Wyatt Amdor, Michael Thomas, and Michael Jensen set the previous meet record of 3:44.83 in 2015, and Nova of Virginia (Wade O’Brien, Charles Swanson, Ted Schubert, and Townley Haas) also set the previous NAG of 3:44.11 in 2015. 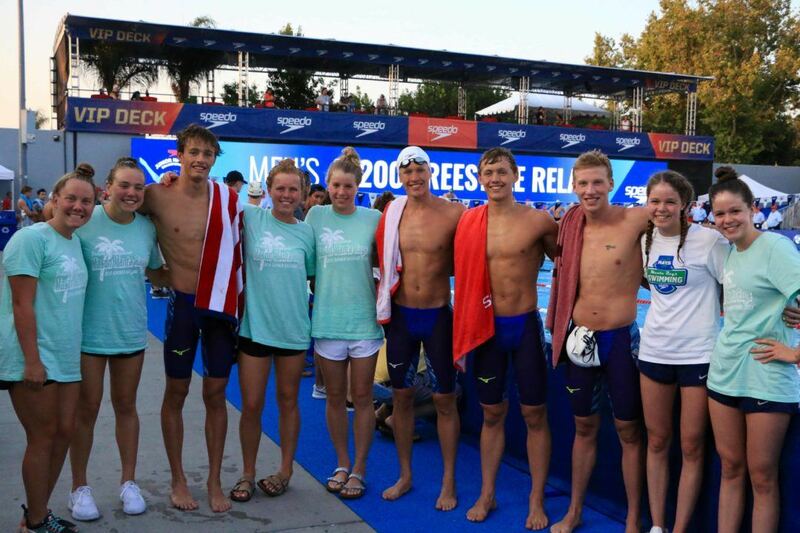 The Manta Rays won the race Saturday by over two seconds, with the Terrapins taking second in 3:45.66 (with a notable 51.44 fly leg out of 16-year-old Andrei Minakov), and SwimAtlanta taking third in 3:47.46. If Carson doesn’t get sponsored by Mizuno I don’t know who will.